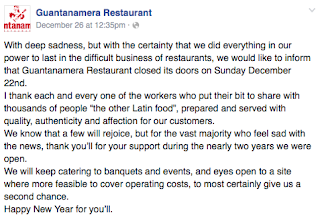 The same week that Nashville Scene food critic Carrington Fox listed owner Alfonso Nieto's paella as one of "2014's most memorable mouthfuls," on December 26 Guantanamera Restaurant posted on Facebook that it has closed. Starting with its April 2013 debut, the Cuban, Caribbean, and Latin American menu had featured a variety of food and drink including fried plantains, tamales, empanadas, maduros, and mojitos. The closure announcement cites location (near the intersection of Nolensville Road and Harding Place) as the economic culprit. The announcement goes on to say that the banquet and events business will survive, and that a second chance for the restaurant - at a different site - might be in the cards.